Ambassadors support us by raising vital funds and also raising awareness of our charity in their local community. Our ambassadors are the face of our charity. Inspire children and young people with Learning Disabilities to follow their dreams! We are hugely committed to supporting our volunteers, who make such a valuable difference to our charity. Ambassadors must be over 18, or if under 18 have a parent/guardian working alongside them. We also require Celebrity Ambassadors who can act as a figurehead for our Charity. An ambassador is not a Trustee and does not have any of the legal responsibilities of a Trustee or for the management of the organisation. The purpose of an Ambassador is to lend high-profile support to the children and young people with learning disabilities supported by our charity. This will, in turn, support many of the charity’s functions like fundraising, campaigning, public relations, marketing and awareness-building for our cause. To register your interest, please email us. To read about our Charity Ambassadors, click on their profile below. Amy didn't have a very good start in life and was ventilated until she was three years old. She has faced many surgeries and never complained. She never thinks of her disabilities and has overcome many obstacles. Amy is enthusiastic and loves to help others, and is a generally happy girl. She will try anything and loves music and crafts. 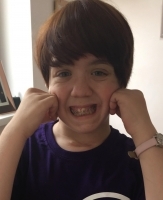 Since Amy first came to one of our Workshops, he wanted to get involved, and of course when her dream came true to Mike Phillips it made her determined to help other children's dreams come true. She has been fundraising ever since, and has raised over £3000 for Follow Your Dreams. Amy wants to tell the world about Follow Your Dreams.